Throughout May, members of the Highlands Facilities Renewal Committee and supporters hand-delivered flyers to area residents. The flyer served to update neighbours on the status of the proposed new community centre, answer some frequently asked questions, and encourage residents to attend HCL’s upcoming AGM on May 29 for more information on the HCL board and various revitalization projects underway in the community. You can view the flyer and the project update presented at the AGM below. On February 20, HCL hosted it’s second open house and welcomed feedback on conceptual designs for its proposed new community centre and revitalized site plans. Dub Architects presented drawings and facilitated a Q&A session with residents. More than 70 people attended the event and participated by sharing comments on note cards and sticky notes. The presentation boards shown at the event were then posted in the form of an on-line survey on HCL’s website from Feb 20-27. Site visitors were invited to participate in the survey and contribute feedback. In total, 89 responses were collected. The following concept drawings were presented Feb. 20. Verbatim comments collected at the open house and through the on-line survey were reviewed by members of the Highlands Facilities Renewal Committee (HFRC) and compiled into a feedback summary that identified themes, suggestions and concerns. 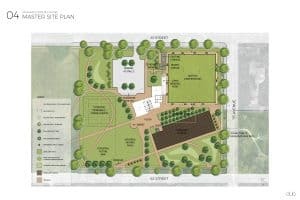 Community reaction was generally positive and enthusiastic to the building plan and reconfigured grounds. The feedback summary was presented at HCL’s Annual General Meeting, May 29, 2018. We invite you to review the feedback summary and corresponding verbatim comments collected in response to the drawings. HFRC thanks residents for participating in the process to date. This input serves as valuable feedback to HCL as it proceeds with refining the drawings over the coming months. There will be more opportunities for the public to participate at that time.